In all our filters we use AISI 304 and AISI 316 grade stainless steel wires, nickel wire, low carbon steel wire, galvanized wire with ISO 9001 –REACH and ROHS certificates imported directly from the best known companies. Filters which we produce with DXR brand name are being used commonly in recycling, plastics, jute, polyester, fiber, rubber, oil, chemical industries. All our products are packed and delivered to customers according to highest protective standards after being thoroughly quality controlled. Through knowledge of market and customers’ demand in these years,DXR has accumulated rich experiences in mesh products deep processing,and self-designed slitting,plasma cutting, ultrasonic cleaning,pleating,welding and other kinds of processing equipment. According to customers’ request, stainless steel wire mesh,nickel wire mesh, low carbon steel wire mesh, galvanized wire mes, etc. can be produced into mesh slits with different width and length,or various shapes of mesh discs,tolerance range can be accurate to ±0.1mm. DXR can supply mesh slits with the length up to 30000 feet, and make sure the stability of product quality and safety of the transportation at the same time. 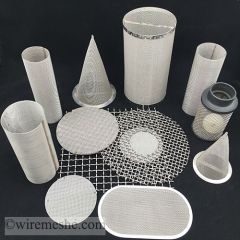 DXR also can design and manufacture mesh tube, mesh bowl, special-shaped mesh discs, spots welding discs and other further processing mesh products.